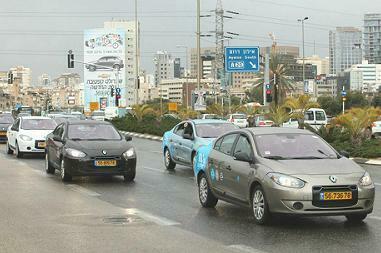 TEL AVIV, Israel, February 2, 2012 (ENS) – On Sunday, 100 electric cars rolled down Israeli roads on their way to employees of Better Place LLC, a U.S. startup poised to do big business supplying EVs and charging infrastructure in Israel. Better Place builds EV charging stations and battery switching stations and sells electric vehicles made by Renault and its partner, Nissan. The 100 cars, all Renault Fluence ZE [zero emission] sedans, are powered by lithium-ion batteries with a range of 160 kilometers (99 miles). They can be recharged at any EV charging station or a robot can switch them for fully charged batteries at a network of switching stations that Better Place has built across Israel to serve drivers of EVs and hybrids. “Just four years ago, almost to the day, we stood together with President [Shimon] Peres and Carlos Ghosn [chairman and CEO of the Renault-Nissan Alliance] and announced our commitment to break the world’s dependence on oil, starting in Israel,” said Better Place founder and CEO Shai Agassi in Tel Aviv on Sunday. “We were a small start-up with a powerful vision and what many called an audacious plan. Today, on our fourth anniversary, that audacious plan reached another important milestone: the delivery of the first tens of cars to employees in Israel,” said Agassi. Sunday’s rollout of 100 electric cars is only the beginning of Better Place’s push into Israel, where petrol prices are high. In December 2011, Better Place signed an agreement with the Eldan Group, the largest car rental company in Israel to lease and rent hundreds of electric cars. Eldan will acquire hundreds of Renault Fluence Z.E. 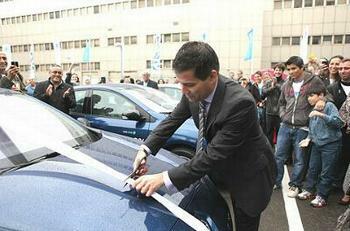 electric cars from Better Place in 2012, and the company will be the first to offer its customers the opportunity to rent electric cars in Israel. In the coming months, Eldan will begin marketing electric cars to companies and private customers, in advance of the first electric cars arriving in Israel. Under the agreement, a leasing customer who selects an electric car will sign a leasing agreement for the car with Eldan and will also sign up for a membership package with Better Place. “I am convinced that the expected demand from companies that have already expressed their commitment to switch to electric cars by signing agreements with us will be strong and I am pleased that Eldan has identified this market demand,” said Kaplinsky.